Speed clean floors with ordinary terry towels. No rinsing no fuss just pure clean fun. Dust cobwebs, clean windows or dry off the hood of your car. And it lasts for years to save money. Ideal for 9 foot plus ceilings and average size floors or floors with area rugs. Perfect for apartments, duplexes, townhomes, condos, small offices. Comes complete with: 9" wide cleaning head, a 4' to 8' fiberglass extension handle and a heavy duty terry cloth towel. Finally kick the habit of pressing down hard on your mop to clean your floor. Our mops are designed to do the work for you. Always mop with a terry towel and the Mary Moppins mop. First, throw away self-wringing mops, wet Swifters and microfiber mops. 100% Cotton Terry Towels provide a fast, thorough, inexpensive way to safely clean any floor. You need a good mop like our Best Home Mop Plus to hold it in place. You don't wash your face with a dirty washcloth. Don't expect a clean floor using a dirty, self-wringing mop. Swifter pads are expensive and take enormous amounts of energy and oil to manufacture and ship to the stores. Even worse they have a history of damaging floors because of the caustic cleaners. Microfiber is made from 80% polyester, which is plastic. Plastic scratches and eventually scratches the finish off any sealed, painted or finished surface including floors. The use of vinegar will pit and damage stone floor surfaces. 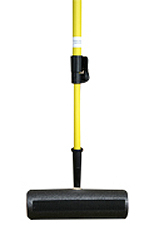 Mop with warm water for tile, marble, granite, slate or composite flooring. Use our heavy weight 100% Cotton Terry Towels that do a better job scrubbing. NOTE: Always dry marble, granite and composite floors to prevent water spots. Discover how quickly you will breeze through mopping with our Mary Moppins Best Home Mop Plus which includes the Fiberglass Extension Handle. You can mop and dry even large areas in less than 15 minutes. Floors: Please see our Floor Care Guide for the proper way to clean hard surface flooring. Wash the towel prior to use. Place the towel over the mop head then press it down. As you lower the mop to the floor, pull back on the handle so the towel swings under the mop head. When the one side soils raise the mop to the ceiling, flip it over and continue cleaning. Simply launder the towel when finished. Cobwebs: Dampen a lightweight towel, place over the mop head and whisk away the webs. Walls: Rinse towel in a solution of 2 ounces of CleanEz per gallon of water. Place over the mop head to quickly clean walls or ceilings. Windows: Dust cobwebs first using a lightly dampened terry towel. Spray our streak free window cleaner Benya only on one half of our Lint Free Towel and place over the mop head. Clean the window with the damp side and dry with the other. Cars and vehicles: This mop is great for drying across the hood and roof of a vehicle. Place a dry, heavy weight terry towel over the mop head and dry.